Including a story from the daughter of a long line of strong Cambridge matriarchs who witnessed the birth of her sister and from an obstetrician who bucked the status quo and assisted a woman giving birth on all fours! This slam is not to miss! Bring your friends and have a drink and an appetizer while enjoying ten engaging stories about reproduction and birth. Leave knowing more than when you came in. Get your tickets today at birthstoryslam.eventbrite.com and find out more information on Facebook. Birth Story Slam: Back in Boston! Featuring stories by mothers, partners, doulas, midwives and obstetricians. Event open to all ages. Winner selected by the audience. Full disclosure: We will not stop you from eating or drinking. Table service provided during the show. – not just the televised versions. Anyone who has witnessed/experienced/or anticipated childbirth. All experiences and perspectives are welcome and encouraged. producer of Boston’s only all-female comedy show Boston Comedy Chicks. Send a description of your story to birthstoryslam.boston@gmail.com by March 14th. Check out our Youtube channel, Birth Story Slam, for videos from the last slam. 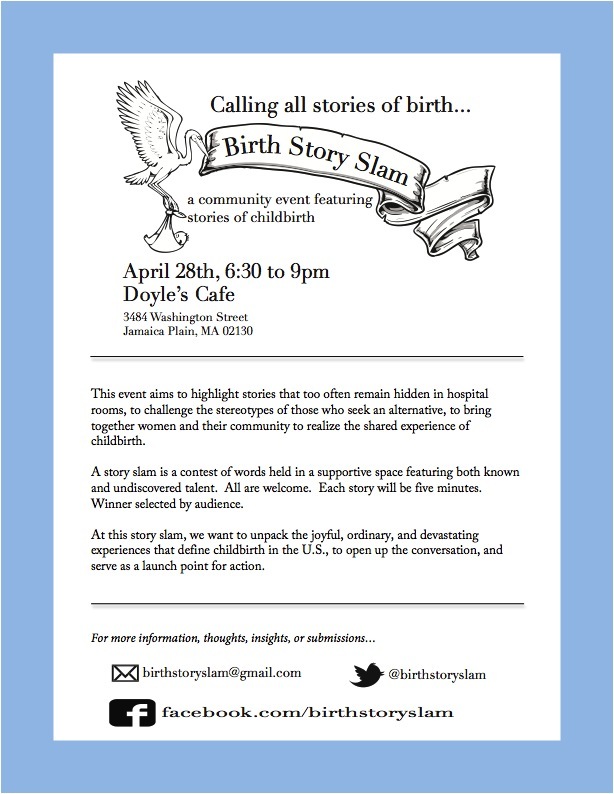 Stay tuned for more information regarding the next Birth Story Slam! Open call: Pitch your story! Free Story Coaching to those selected! We are looking for birth stories to be submitted prior to the event to make sure we capture a diverse range of experiences. If selected, you will be eligible to receive coaching from Norah Dooley, all around amazing storyteller, executive director and co-founder of massmouth. Doesn’t have to be fully developed, just give us a description of what you plan to tell. We welcome all submissions!! Tell your friends! Email birthstoryslam@gmail.com if you would like to post in your community space. Feel free to download for email sharing!